Okay, I know that a lot of you don't always share your thoughts and pieces on our writing prompt day. I do get some of you sending me your stuff, which is great! I created this day not just to keep my author friends' juices bubbling, but also to encourage those that don't write for a living to put thoughts on paper (or computer in this age). As long as I can remember, I have always kept a journal, always wrote stories and always have another one or two under the surface when working on something else. My mind is full of ideas because we are surrounded by situations, people, scenarios and other things that have stories behind them. Next to music, writing has always been a way to 'bring me back' or calm me down in a creative way so I don't get into trouble (lol). 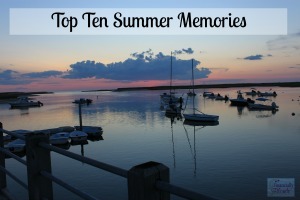 Today, since back-to-school is just around the corner, I thought a great topic would be jotting down your top ten summer memories. They can be recent or even as far back as childhood. We all have some wonderful memories we hold dear. 1. My favorite uncle 'teaching' me to swim by tossing me off the lake at our cabin when I was no older than five. He stood on the dock yelling, "Swim to the ladder!!!" I cried the entire time, I was mad when I got to the ladder but my uncle was there to jump in, if need be, AND I learned to swim. 2. Going fishing for the first time. My Uncle Rick taught me how to fish and even though it was pouring rain, I caught my first fish which we fried up for lunch. 3. Frog hunting. Yes, you read that right. My friend, whose cabin was two doors away from ours, and I would go out to a marshy path just down the road from our cabin and catch tiny tree frogs. We always had to let them go, but it was fun. 4. Fixing the roof on our cabin. One summer my uncles, grandpa and bonus dad replaced the shingles on the cabin roof. Every time someone wanted food or a drink, they'd yell down the chimney with their order. One of my uncles put a lawn chair and tv up there because he said the reception was better. 5. First summer with my oldest. The cabin was long gone, but it was special spending my daughter's first summer together. 6. Fantasyland Hotel. I started a tradition with my children that I'd take them to a theme room every year as a way to say 'good bye' to summer. We have a blast and either end up going to the waterpark or to Galaxyland (that's like an indoor carnival). We shall not discuss their favorite part: throwing bath bombs into the hot tub. 7. Learning to ski. Ya, well, I fell, then panicked because I heard the theme song from Jaws but it was a great time. 8. Sunsets at the lake. When the boats were put away, and the water was quiet and still, I loved sitting out on our dock just before bed to watch the sun go down, turning the sky different shades of orange-y pink. 9. First summer with my husband. We never went out and did much stuff when it was just me and the kids but that summer was filled with its top ten all on its own. We went to a heritage festival, watched fireworks, had picnics, went camping,,,it was awesome. 10. My favorite memory of all is simply being able to lay on a floaty of some kind on top of the water and stare up at the sky.